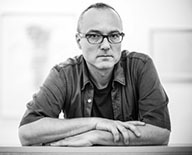 Born in 1966, studied composition in Vienna and then Stuttgart under Helmut Lachenmann. He teaches at the University of Music Graz as a professor of Analysis, Music Theory, and Composition. Gadenstätter’s musical undertaking explores the compositional resynthesis of perception, sensation and feeling. For him, this should bring together the trinity of listening, comprehension, and composition. His recent work concerns: the transformation of acoustically triggered, pre-formed feelings (in the series E.P.O.S. : les premiers cris, les cris des lumières, les derniers cris for different ensemble arrangements); the notion of the banal (in the pieces Semantical Investigations 1&2, as well as the essay “Was heißt hier banal” [What do we mean banal? ]); the poly-modality of listening (in häuten, schlitzen for string quartet 1&2, ES for voice and ensemble); as well as musical iconography (in the series ICONOSONICS 1 – 3). His larger works thematize these ideas in multimedia form, such as daily transformations for voice, ensemble, electronics, text, and film, with Lisa Spalt (text) and Anna Henckel-Donnersmark (film). The Donaueschingen Festival, Musik der Jahrhunderte – Stuttgart, WDR – Witten Days for New Chamber Music, Wien Modern, ORF/RSO (The Vienna Radio Symphony Orchestra), Musikbiennale Berlin, Salzburg Festspiele, Musikbiennale Salzburg, Steirischer Herbst, Ultima – Oslo, and more.